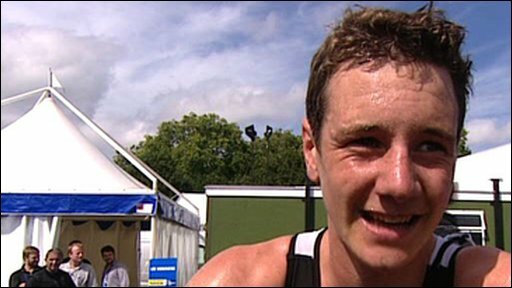 Britain's Alistair Brownlee won his fourth successive World Championship Series triathlon in style in London. Brownlee, 21, from Leeds, broke from the leaders just before the final lap of the 10km run to win by 10 seconds. The win put Brownlee top of the series rankings again after six of the eight legs, culminating in September's final. 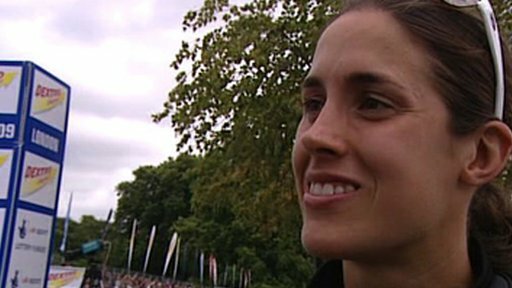 Switzerland's Nicola Spirig powered to victory in the women's race, leaving Sweden's Lisa Norden and British world champ Helen Jenkins in the final 200m. 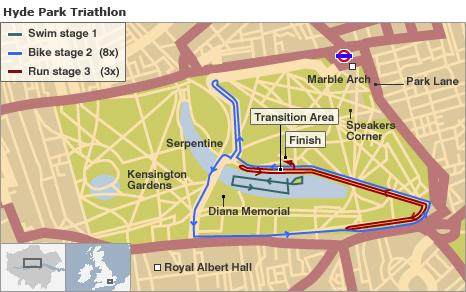 After a blistering race in warm conditions in Hyde Park, Brownlee finished in one hour, 41 minutes, 47 seconds, ahead of German Steffen Justus and New Zealand's Kris Gemmell third. Britain's Tim Don finished in ninth while Brownlee's younger brother Jonathan came 27th. Alistair Brownlee had gone into the event on the 2012 Olympic course fearing only world champion Javier Gomez but the Spaniard crashed off his bike early in the 40km second phase. "I can't believe it. It was tough. It's great to win at home - the crowd was unbelievable," said Brownlee. "But it's not good to win a race when the man you want to beat crashes out." With series leader Maik Petzold choosing to miss the race, Brownlee was the only member of the world top five left in the race by the time the 10km run leg began. American Jarrod Shoemaker pulled out after a problem during the bike and Australian Brad Kahlefeldt injured his foot during transition from the bike to the run. In farcical circumstances, bike leaders Ruedi Wild and Bruno Pais missed transition and rode an extra 5km lap. "I never expected at the start of the season to get a win in Madrid, Washington or Kitzbühel or here," Brownlee added. "I've had a lot of luck on my side, but you've got to make the most of it and I think I have. It's been a great run of results and I hope it continues." 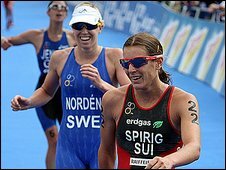 Behind the leaders after the 1500m swim in the women's race - with wetsuits banned because of the temperatures - Spirig pulled back on the bike and bolted away late in the run. World champion Jenkins reduced the bike group with two bursts of acceleration but could not go with the final sprint. "To get on the podium is brilliant!" said Jenkins, from Bridgend. "I am so pleased, especially in front of a home crowd. "They're such good finishers and they've been up there all year, so I'm just pleased to be so close to them. "It was a fantastic atmosphere out there. It's a really fast course and it's great that three years out we're having a chance to race at the venue." Despite opting to miss the race, Australia's Emma Moffat retained the overall series lead, with Norden moving into second place, Spirig moving to 13th and Jenkins jumping five places to fifth. Under her maiden name Tucker, Jenkins won the world title in a one-off race in Vancouver last year but the crown will be decided in a new series format this year.